Jack Drews and his son Tony have been racing Triumphs for quite some time and, as a result, have come up a number of improvements to stock parts that have a tendency to break or under-perform during race conditions. A visit to their web site (http://www.tonydrews.com/) will find a link to Jack's Parts and the cool stuff he makes & sells. Make sure you check out their videos, especially the one called "Old Blue's Demise" where an axle breaks, causing their car to flip during a race. One of my concerns was about removing the old stub axles which have been in the car forever. Jack assured me that good whack with a BFH (Big F@&#ing Hammer) would solve the problem........and he was right. And the hammer wasn't even that big! The first thing you'll notice is the cool wrapper it ships in. It reminds me of those old Chinese Finger Torture toys that us old guys had when we were kids. Then when you compare the original/stock axle to Jack's you'll see and feel the heft of it.....it's thicker, but he supplies the proper size nyloc nut for the back and castle nut for the front. The kit ships with: 2 axles, 2 spacers, 2 Grade 8 nyloc nuts, 2 D washers, 2 castle nuts and 12 shims - 2 each @ .015, .010, .007, .005, .002 & .001. Other then thickness, it all looks pretty much the same at this point.....and those are my old bearings being used for the picture taking session and explanation. OK....imagination time. To show how this works I couldn't include the actual hub in place or you wouldn't be able to see how it all goes together. So just envision the hub spinning between the inner and outer bearings. 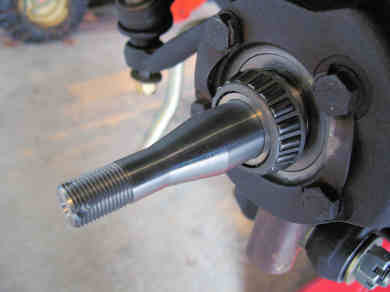 The idea here is to use the right combination of shim sizes to allow the hub to spin freely when the castle nut is cranked down to about 50 pounds on the old torque wrench. If, after tightening, it doesn't spin....add another shim or a larger shim. If it's too loose, take away a shim or try a thinner one. Sooner or later you'll get the right combination. Now that you can visualize how it goes together inside the hub, here's the step by step procedure that I used with much help from Uncle Jack........he probably provided more tech support on this one sale then on all his other sales combined! Remove old stub axle . 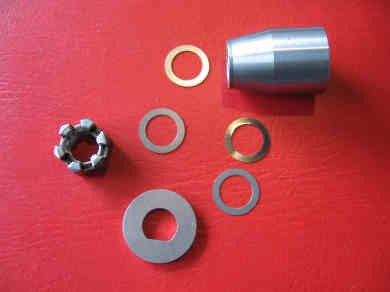 Install new axle and tighten with supplied grade 8 nyloc nut. 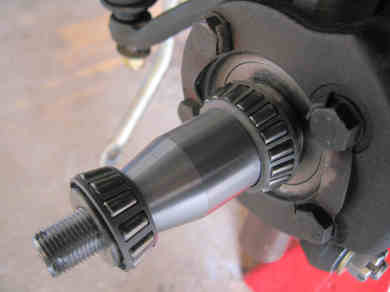 Slide inner bearing on to axle. If it's new, pack it with grease. If it's old, I'd leave the old grease in it for now and re-pack it later. DO NOT use the felt oil seal yet. Slide spacer on to the axle. 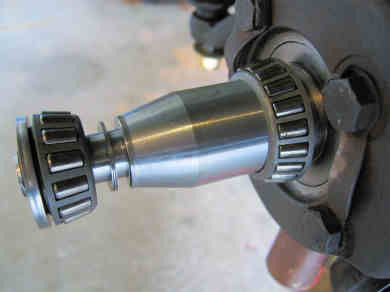 Make sure there's no grease between the bearing and the edge of the spacer at both ends of spacer. 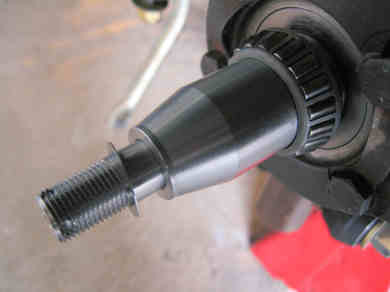 Put the hub on to the axle and up against the inner bearing. 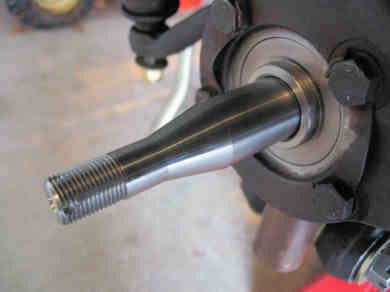 Slide a shim (start with .007) on to the axle. Put the outer bearing on to the axle and in to the hub. Test for looseness, both side to side and up and down. Make sure it still spins freely. Once you've got the right shim combination, you can do final assembly. Even though I had new bearing with new grease in them, I repacked them because they had been on and off the axle so much during the fitting that they could have picked up some dirt. Here's where I screwed up........I installed the inner bearing and felt seal on to the hub and then realized it wouldn't fit over the spacer! DUH........... so........ from the back of the hub, drop the spacer in to the hub, then the inner bearing and lastly, the felt seal. The felt goes to the outside of the hub toward the center of the car. It should also be saturated with fresh oil. Mount this assembly on the axle. 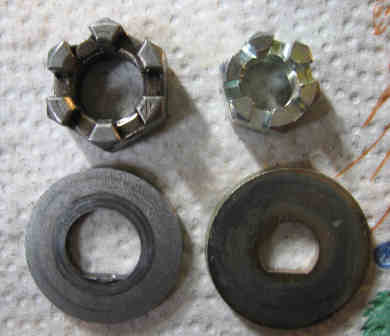 Slide your shim (s) on, followed by the outer bearing, "D" washer & castle nut. Tighten to 40 - 50 pounds. 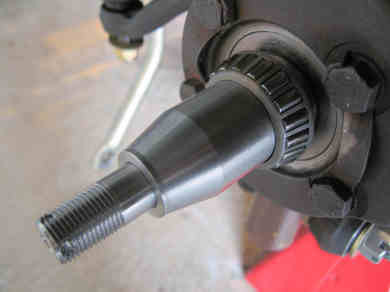 Install the cotter pin & grease cap. NOTE WELL: the hub will not spin freely with the felt seal in place but, as long as you got the shims correct without the seal, there will be no problem. Once your tire is mounted, everything spins as it should. Do the other side and you're good to go.